Sweet mother muffin. This is insane Alex, and agree with Travis 1000000%, must build. Was thinking of building this on vero but the pcbs are still available on ebay so i bought one. Here is the link if anyone wants one. Still loads available by the looks of it. I noticed in the build guide that the LEDs and LDRs aren't taped or heat shrinked together. Does the light bleed cause problems, or am I overthinking this? Hasn't bothered my pcb version. I've put it together. I checked all of the connections and the board. SO far it looks like the board is functioning. The led/ldr combos are pulsing and the pots alter the speed etc. I only get dry signal wether the pedal is bypassed or not. I did include the dry out jack but I am not plugged into that. When I hit the phse/vibe footswitch one setting passes dry signal and the other cuts everything. The blend pot sounds as if its changing something from one end to the other but its still all dry. It seems close but there has to be something small messing up the output of the phased signal. Can you link the schematic you used and I can go through the layout? 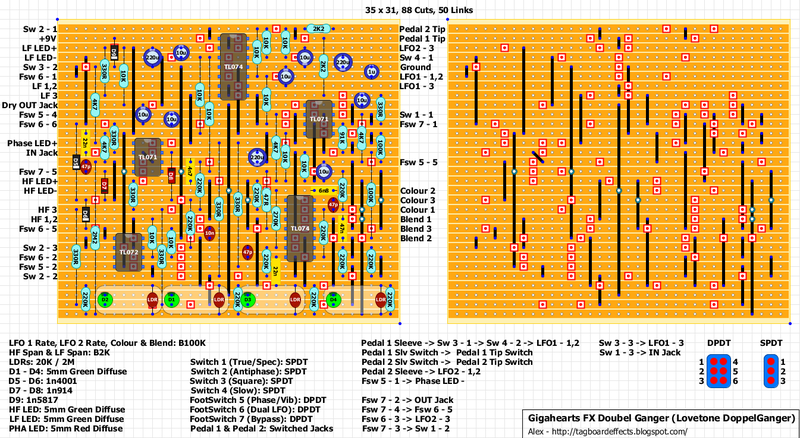 You can find the PDF link with the schematic in the pedal's description above. All my latest layouts have schematics links in their description. Well if anyone else gives it a shot and it works, let us know. Fantastic simply brilliant. Could you teach us some of your methods for doing these incredible layouts.I would request that the site put up a couple of more layout guides or maybe an article,post,blog or video of your approach to planning I can follow everyone of these with a schematic( i am glad your posting the reference schematics now) in my hand but you really have this down to an art form. Its impressive. .It just baffles me how you decide to arrange it all for these mega builds.Like the univibe its smaller than the pcb 20 percent you cloned. I wish there were some good tutorials on the process and approach for doing layouts.If you know of some please let us know . I done some stuff on perf but its easy on perf you just basically plop the schematic down and solder it up pretty much.I dont care much for perf though to much time a flipping the board over and linking jumpering and bending legs and leads.Stripboard/ Vero is a puzzle and then some things touch or are connected that arent on the schematic and it doesnt change the outcome and im not just talking about grounds. do you start big and condense? do you do rough draft on paper first? do you count out grounds? It would be a great thread for the forum . i know a couple other guys that are building these and they too want to no the ins and outs and tricks to doing these . The one layout guide on here needs some friends.ha ha are there any good you tube videos i have not found any ? i have decided its time to do this and want to get a good grasp and have a strategy . ill bet some layout guide creation videos would get a ton of hits on you tube. Thanks Strassercaster! (I never remember the real names!). I don't believe there are videos for large layouts. Most people prefer PCBs for these kind of circuits. I think Mark's Layout Guide is the best to start with. I've started from very small schematics (with atrocious results) and kept practicing. It may sound strange but I never plan a layout. My main objectives are: try to keep pots and switches lugs close to each other and leave enough space for large components (layouts could be smaller but when you build it won't be simple to fit them). Once I start adding the components I usually understand if I need to extend it or I can reduce it. One important suggestion I could give you is to check the op-amps datasheet and decide what's best for your layout (pinout-wise). Most schematics are drawn from PCBs and the op-amps pinouts are not always the best for vero. For example the Doubel Ganger schematic used 2 TL072s. Once I kept drawing the layout I've realized that 2 TL071s instead of the second TL072 would have made the layout smaller without changing anything. 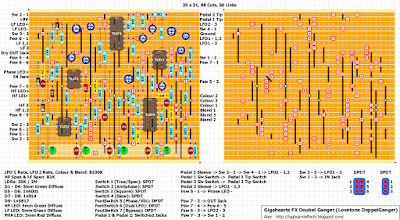 I see how the layout is going before I decide how to number the op-amps pinouts. Don't go too fast and keep checking the schematic to spot any possible mistake. It's less complicated than try to fix them at the end. Once the layout is finished and I believe it should be correct I start moving components around to reduce the board size or make it look better. I use time, luck and a lot of OCD! This is the way I draw them and it doesn't mean it's the best way. Each person does it differently. As you've probably noticed I'm not very good at explaining things but I hope it helped you a bit. At the end I think practicing as much as you can is the best way to do it. You rock man! I am a 125b keep in mind the 23 by 30 works great for the 125b boxes plus you get some depth.The small bear brand will do 24 wide if you did side jacks 24 by 33(or more possibly) would fit as well because they are deeper.I decided to do top mount for my personal pedals just becasue if they are all top mount its less messy and you can get more pedals on your board .apples and oranges ha ha Thanks again for the tips. i have some ordered units to do and a few layouts you did on request to make then ill spend a week or a month just working on layouts till i can do a tube screamer or something medium sized . Hi Alex. Slowly working my way through this one, trying to condense it doing all the things that's "frowned upon" haha. I'll hopefully have it finished by the end of the week! Cheers man for an epic layout!! Thanks Ciaran. Did you check if it matches the schematic? I think it does but with large layouts you never know. C10 is marked 1nF on the schematic but the PCB's BOM says 10nF. There's a picture of the populated board in the PDF. You can see that C10 is actually 10nF. Ahh....I see it now. Yip, definitely 10n sorry. It was a pig to look over (the way the schem is drawn didn't make it easy) but yip, matches the schem perfectly! Will do man. Cheers again! FYI I built a second board and it acted the same way as the first. It looks as though its working but you only get dry signal. The spectral/true switch in one position will kill the signal when bypass switch is off. You get bypass signal in the other position though. When activated the phse/vibe switch kills the dry signal in one position as well. It seems to have a few wiring issues. is it stereo jacks for Pedal 1 and 2 ? If so, where are that points - SLv switch and Tip switch? You can use stereo switched sockets. If you check the link in the circuit's description you'll find a PDF with explanations and pictures of the finished board which would help you a lot. Have you checked the original project PDF? Let me know if it's still confusing. well i got the stuff i need to give this a go. this will be the most difficult build i have attempted to date.. the phase 100 and harbingor one i made were up to this point . im going to take it very slow this is not a red rooster ha ha. I have built this one. It seems that a great part of the circuit works but there is still some problem at the audio path. LFO part works OK, both HF and LF LEDs oscillate (on the board and cotrol panel LEDs), rate pots, hf-span and lf-span work. Switches in the LFO part work as well - slow, square, dual and antiphase switches work as expected. In one position of phase/vibe switch, I get clean uneffected signal, in the second position everything is killed. Hi Sloup. I've checked the layout 3 times and Ciaran has checked it too. Maybe there is something wrong with the schematic but the guy has built PCBs out of it. The best would be to compare the schematic to the pcb but I don't have much time at the moment. I'm afraid I do not have enough skills to compare PCB with the schematics. At least I'll try to check my board again and compare with the layout. Think I found it!!! Phantom cut under the 47nF bottom right. The 074 has no ground reference. Bridge that cut and report back. I spend that much time comparing the pop board to the schematic I completely missed the cut hidden under that cap. Sorry about that. I really should get this finished. Mark is going to fire me! I want my 33 cents back! Verified! :D Just jumped the cut that Ciaran mentioned and everything works like charm! Both kind of bypasses, all the switches, all the knobs. I just omited the Pedal 1 and Pedal 2 outputs and Dry out jack. You guys are incredible. I'll send some pics after finishing. Thank you all! Thanks for verifying it Sloup! We were just testing you! I wanted to fit it into 1590BB (for me real challenge with the 35x31 board), so I used toggle switches in place of Phase/Vibe and Dual footswitches and I omitted Direct output and Pedal1 and Pedal2 jacks. What an amazing layout, kudos to you!! Any way we can add a tap tempo? Feeling crazy. PCBs still available normally on ebay down for xmas period will be back up new year. Any particular thing to search for? or a store link etc? I might be interested in one. :) Thanks for sharing.